Edo is a professional duelist that frequently visits Duel Academy. He wanted to prove that Judai is a fake and said that Judai used his deck ideas. In many ways, he involves himself with a mysterious person named, Saiou. 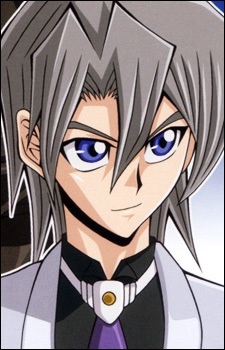 He believes that Destiny plays a role in dueling and that he'll become the next "King Of Games". He has been mentioned once in the manga, but is yet to make an actual appearance. Edo's deck is focused around a special series of "Hero" cards. These cards unlike Judai's are DARK monsters. The rare themed DARK Heroes were designed by Edo's missing father. Based upon tales of British literature, Edo's deck is made up of "Destiny Hero"'s. The Destiny Heroes each have unique abilities that change the way the game is played.